Peace Sign. 6″ x 6″ Watercolor Pencil on Paper. Sharyn Dimmick. Second Prize: To Lynn for zucchini roasted with shallots. Third Prize: To Suzanne for her lentil potage. Honorable Mention to Will for his astounding cookies. Lauren will be sending him one of her chili pepper oven mitts. At this writing, Babu has chosen the cookbook as his prize, Lynn has chosen a Paris CD and we have not heard from Suzanne yet. Please remember that even if you did not win you will be eligible for free shipping of any Kale Chronicles’ painting should you choose to purchase one or more before midnight December 31st. In addition, if you purchase a painting before October 15th, I will take ten percent off the purchase price and if you purchase a painting before November 1st I will take five percent off the purchase price. These are the lowest prices ever offered for my paintings so take advantage of them while you can. 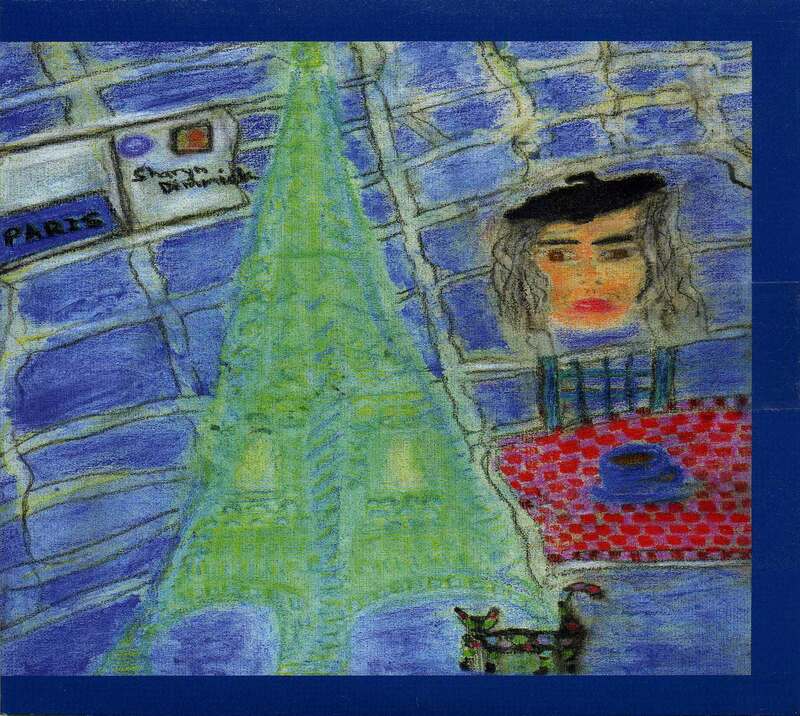 You can also buy your own copy of my Paris CD, using this link: http://cdbaby.com/cd/SharynDimmick I appreciate each and every sale: they help me survive as an independent artist and also help fund new work (I have a second CD in progress). 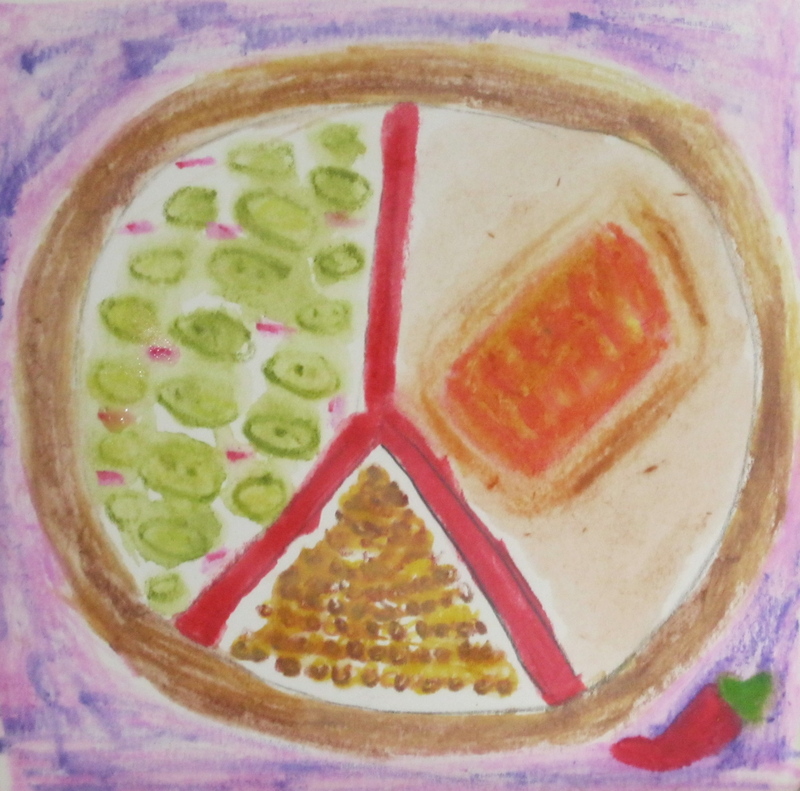 To look at the winning recipes and other submissions, please visit The Lauren Project page. Please feel free to submit additional recipes for Lauren there any time: there is no deadline on generosity. Friday I called my friend Margit to ask her something or other and she said, “Oh. I forgot to tell you — the pears are ready for picking.” She has a backyard tree. After lunch I walked down the hill, borrowed a tall kitchen step stool and began to pick pears. Most were green (good pears ripen off the tree), a few were yellow. I took a large bag home and revised my plans for making a large Gravenstein apple pie for my ballad group on Saturday, deciding instead to make a Pear Tart Tatin. This time around I added a jigger of dark rum to the pears after I cut them and sprinkled a few grains of crushed cardamom over the pears and caramel before I laid on the crust. Pain Perdu with Pears. 6″ x 6″ Watercolor pencil on paper. Sharyn Dimmick. When the tart tatin was in the oven I noticed that I still had rum in the pie plate where the pears had been. You know I hate to waste things, so I went fishing for the yellowest pears I had, the ones that would not keep another day. I peeled them, cut away the cores and stems and any brown, mushy spots. I plunked them into the rum. After I finished flipping the tart tatin onto a plate I poured the pears and rum into the cast iron skillet and set it in the still warm oven. I hoped the pears would start to cook from the residual heat and perhaps soak up some caramel flavor from the pan. This morning I wrote and read and listened to music for awhile before breakfast, perhaps a bit too long. I knew I wanted coffee and I knew I needed to cook the pears, but what would I do with them? I didn’t want to take the time to make a pot of oatmeal. Ah. Pain perdu, “lost bread,” aka French toast. Because I was only feeding myself I took 1 long slice of sourdough sandwich bread, cut it in half and toasted it in the toaster oven. While it toasted I beat 1 egg in a shallow pan, added about 1 and 1/2 Tbsp of sugar and a splash of vanilla. I put the bread into the egg mixture, turning it over once. Meanwhile I set the cast iron skillet on low heat. I heated the pears, rum and leftover caramel for a few minutes, then pushed the pears to the side to continue cooking and added just a smidgeon of butter, perhaps a teaspoon to prevent the bread from sticking. I turned the heat up to medium and cooked the bread on both sides before removing it to a plate and spooning the pears and caramel on top of it. Food Notes: This made a lovely breakfast as is, but I could imagine adding some ricotta, quark or yogurt for the contrasting flavor. Other Notes: The Lauren Project is cooking right along. Several people have submitted recipes to the contest. Some people have sent us more than one. But those of you who have not submitted anything yet still have some time: the contest deadline is August 31, 2012, 12 midnight, Pacific Time. After that, Lauren will review (and perhaps test cook) some of the recipes and we will begin awarding prizes. In case you have forgotten, or are new to this contest, the prizes will consist of one red chile pot holder, one signed seasonal cookbook with paintings by Sharyn Dimmick, one copy of Sharyn’s music CD “Paris,” and one Kale Chronicles’ painting of your choice. One prize per person, please. When Lauren chooses her first winner I will contact that person to ask which prize they want and then we will move to the second winner and so on until we are out of prizes. 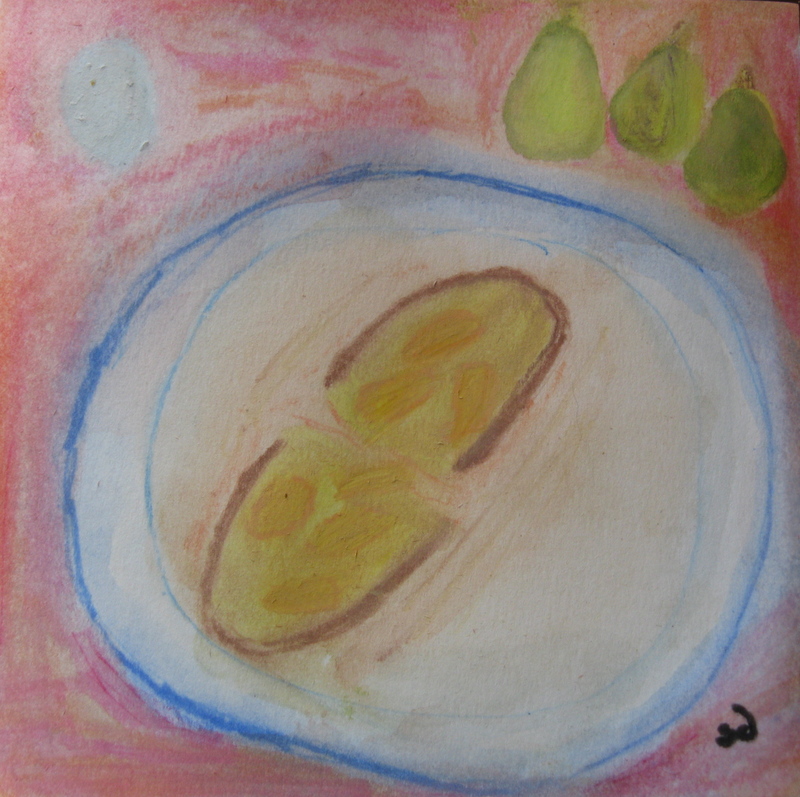 All persons in the USA or Canada who submit recipes will be eligible for free shipping on any Kale Chronicles painting they purchase through the end of 2012. 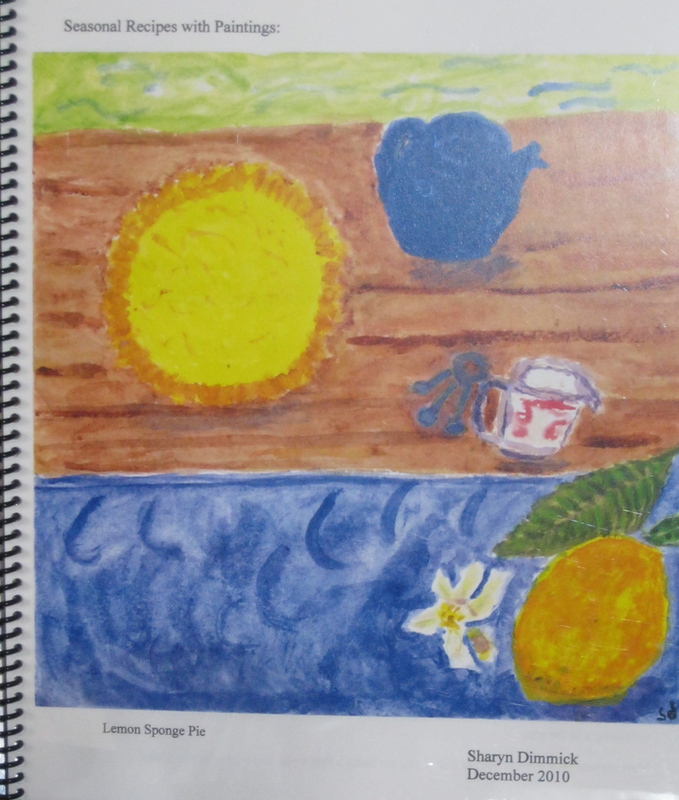 Photo shows cover of Sharyn Dimmick’s cookbook, Seasonal Recipes with Paintings, developed before the beginning of The Kale Chronicles blog. Long before The Kale Chronicles blog began I frequently wrote about what I was cooking each week. In 2010 I assembled a limited edition cookbook called “Seasonal Recipes with Paintings,” featuring a recipe for each month of the year with an original painting. I gave these for holiday gifts. For half of 2010 and half of 2011 I lurked about on the A-List Blogging Club, learning about blogging and what I did and did not want to do with my maiden blog. Then one night I was talking to my friend Neola on the phone and she said, “Why don’t you write about food? Everyone always likes it when you write about food — I even like it and I don’t eat vegetables.” It’s true: whenever I wrote about food my writing friends said things like “You should do a cookbook” and “I can’t read your writing when I am hungry.” Neola suggested that I write about what I got in my produce box each week and what I did with it. Then I happened upon a post called “The Kale Chronicles” on the net and I knew I had my blog title because I frequently struggled with making kale edible, despite the fact that it had been showing up in my box regularly for the past several years. I painted a “cover painting” for the blog, now in a private collection in Florida and chose an image of it for my gravatar — that little signature picture box you will see in the Comments section. And I decided I would paint for the blog, rather than take photos because I enjoy painting more. The lurking, the phone call, the writing, the produce box, the inspiration for the title, all came together to create The Kale Chronicles, which is a year old today. I thank Neola, the A-List Blogging Club, the practice of writing as taught by Natalie Goldberg and every single one of the 106 subscribers and 15,699 visitors who have taken the time to read the essays, cook the recipes, look at the paintings, buy the music, wish me well when I was ill, encourage me to go on and be or become my friends online and in the real world. I am deeply grateful for your company and support. One of the things that I am most grateful for in my adult life on a daily basis is that I can eat whatever I like. When I was a child I had to eat everything on every dinner plate no matter how I felt about it — I don’t mean I had to try things or taste them: I had to eat “a reasonable portion.” If I served myself a portion that my father did not deem reasonable, he would serve me twice as much. When I grew up I vowed that I would never eat a long list of foods again: mayonnaise, avocado, English peas, asparagus, tuna, liver, etc. I learned to eat some formerly despised foods, including cauliflower and eggplant by preparing them differently than my mother did. But the big deal is that I get to decide what I eat now. Some people do not get to decide what they will eat. Some people are poor enough to eat whatever they can get. Others have restrictions due to illness or sensitivities. My friend Lauren, one of my writing pals who studies with Natalie Goldberg and was with me in France, follows a restricted diet due to a poorly understood autoimmune disease. She was happy in France, eating a wide variety of non-chemical, non-genetically modified foods, but then she came back to the United States and was finding it hard to get quick, tasty healthy meals on her table. And then I had an idea: I had seen her food list in France and my blogging anniversary was coming up. What if I let the food blogging community see her lists of what she could and could not eat and then let bloggers send in recipes for Lauren? So, today, on The Kale Chronicles’ first anniversary I am pleased to announce The Lauren Project, a recipe contest that keeps to the foods Lauren can eat. Below you will find 1) a list of foods Lauren can eat and 2) a list of foods Lauren cannot eat. It is important that you look at both lists when designing your recipes for her because using a restricted food will mean that she cannot try your recipe. 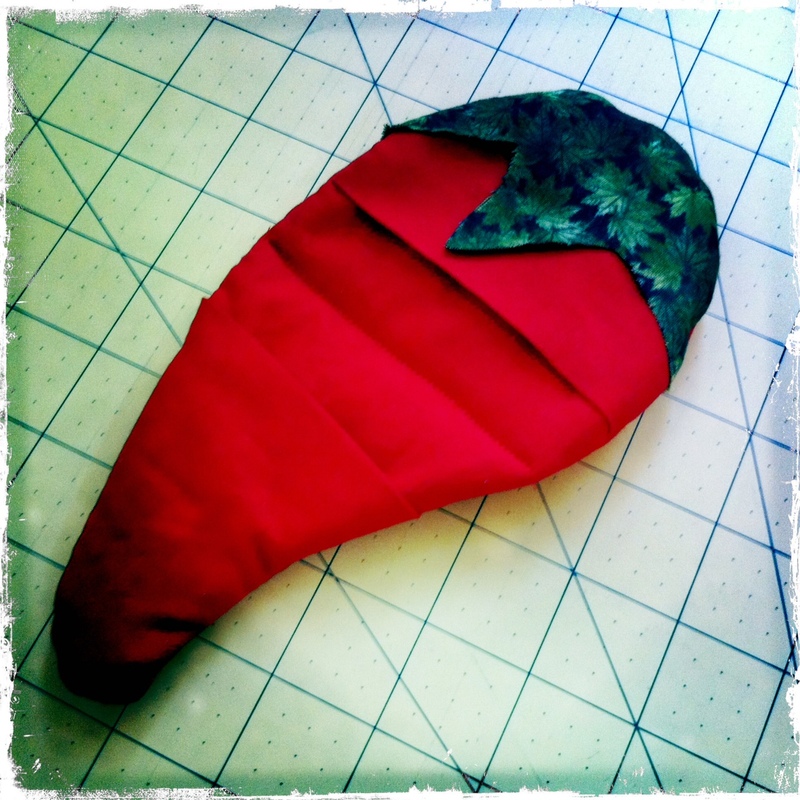 Lauren’s chile pepper pot holder in process — the real thing is way cuter. Prizes. Yes, there will be prizes. Lauren and I conferred on this. Lauren will award a homemade chili pepper potholder for a winning recipe. I will award 1) a signed Kale Chronicles’ cookbook (made before I started the blog, featuring fourteen recipes and thirteen prints of my watercolor paintings) 2) an original painting (winners’ choice) 3) a “Paris” CD (full-length folk music CD, featuring songs by Joni Mitchell, Leonard Cohen, Richard Thompson, Shelley Posen and yours truly, which includes a booklet of original paintings and all of the lyrics to all of the songs). Also, anyone within the U.S. or Canada who enters a recipe in The Lauren Project will be eligible for free shipping for any painting he or she purchases from me in 2012. Here are the ingredient lists. Please read them carefully. Seasonings: salt, ginger, cumin, coriander, turmeric, cardamom, anise, rosemary, sage, cloves, vanilla. Other: olive oil, coconut (including coconut milk), organic non-genetically-modified sugar (must use sparingly). Maple syrup (also use sparingly — Lauren needs to limit her intake of all sugars). 2) “No” Foods: Must avoid — DO NOT USE IN YOUR RECIPES — : grains containing gluten — no wheat, rye, or products made of them. No mushrooms or fungus of any kind. Nothing containing mold — no blue cheeses, moldy cheese rinds, etc. No goat cheese or goat’s milk. No cheddar cheese. No yeast, vinegar, mayonnaise, alcohol, caffeine, honey, agave, cocoa, chocolate or artificial sweeteners. Nothing fermented. No soy or soy products. No basil, oregano, paprika, chili, sesame, cinnamon or mint. No beets, cucumber, eggplant, bell pepper, chili peppers, potato, tomato, cabbage, onion, avocado or tomatillo. No blueberries, strawberries, melon or peaches. No pork, turkey, ostrich, tilapia, shellfish or mollusks (mussels, clams, etc.). No hazelnuts, walnuts, Brazil nuts, pinto beans or lima beans. one of my biggest issues is breakfast. i just can’t seem to manage cooking that early in the morning which means i usually just skip breakfast and go straight to lunch (or eat breakfast at 11:30). my favorite breakfast is beef and butternut stew – i do best with heavy protein and very few grains – but i can’t eat it every day. i’m also hungry for one-pot meals that i can cook in bulk and freeze. my last request is for a simple way to get more veggies into my diet. I don’t do well with raw, so things that i can cook quickly with minimal prep (maybe also some good pre-prep tricks for processing veggies when i buy them so they are ready to cook at a moment’s notice). oh, and one more thing… eggs are best cooked in things or scrambled really well. i don’t always do very well with whites. if anyone has questions regarding items not on the lists i’m happy to answer inquiries (mostly they are borderline foods that are okay sometimes or when prepared in certain ways. thank you so much for doing this and for even thinking of me. it means a lot. Because we are being kind to Lauren, we ask that you get your grains and organic sugar from reputable gluten-free and non-GMO sources. Organically grown things are less likely to cause less trouble than conventionally grown products. But you can experiment with what you have in your cupboards and then write the recipe for organic, gluten-free products. Deadline: You must submit your recipe(s) to The Kale Chronicles by midnight Pacific time on August 31st, 2012. You may submit them in the Comments field here, or post them in the Comments field of The Lauren Project page. (Look above and click on it). We will announce the prize winners in a September blog post. You may also post your recipes on your own blogs with the tag “The Lauren Project” and a link to this contest post, but if you don’t send them to me here as well I might miss them (and we wouldn’t want that). I was working on a recipe for Lauren this week, but then I felt the irresistible urge to go to another music festival in Sonoma County, stay up till 2 AM, flirt with some men, sing some songs. To do that, I had to bake a Gravenstein apple pie, make a Greek salad, cough up twenty bucks, wash my hair and spiff up. I came back tired and happy with my hair full of campfire smoke. I will keep working on the recipe and post it by the deadline, hoping to inspire you to create recipes for Lauren as well, but I might inspire you to run off to folk festivals and flirt with guitar-players. Oops. C’est la vie. List update. We have just added “coriander” to the Yes list as of 8/23/12.